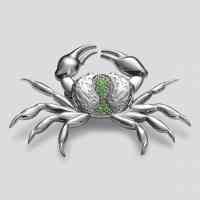 Designed exclusively by Georgia Hardinge for Banneya London this Crab Brooch will look fabulous on a coat adding glamour and bling to any occasion! We are in love with the cut out work and its sparkling back! A statement piece to wear every day! 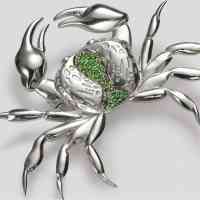 The Crab Brooch can be made to order to suit your style. Choose from 18 carat rose, yellow or white gold, and a range of stones including aquamarine, diamond and sapphire for a custom piece of fine jewellery. - Diamond option: 0.16 carats approx.